It seems like there's a standard menu floating around the city: frisee salad with a poached egg, some sort of pork belly, hamburger, and pizza. It could be the economy, an idea that city diners want to eat the same thing wherever they go, or simply lack of guts to cook from one's own perspective. That's why it was so refreshing to go to a place like Namu. The menu is a mix of small and large plates that make for a Korean style family meal. The first thing on the table is panchan, three types that were all light and gentle rather than pungent, a good way to start the meal with something well balanced that doesn't punch the lights out of your taste buds. Our first course was with Hog Island Oysters, served with yuzu ponzu, wasabi and a chojang korean chili sauce. The oysters were fine their own, both the sauces overpowered their sweet taste. After trying oysters with various sauces, dashi broth and similar acoutrements, my personal bias is for quality raw oysters with minimal adornment. Next came the uni shiso tempura, cucumber & kaiware salad with lemon soy vinaigrette. I'm not sure about this tempura, it had a mild uni flavor though the salad was a good compliment to the flavors. My dining companions enjoyed it. 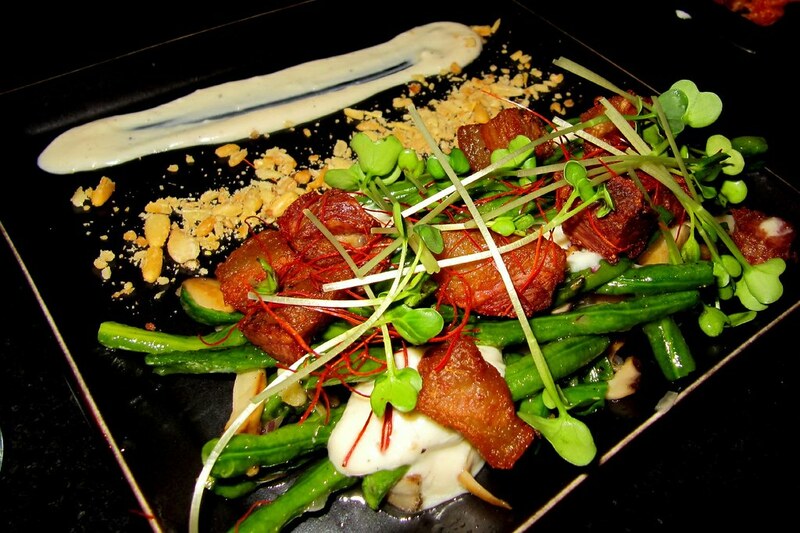 Chinese long beans, boccalone guanciale, trumpet mushrooms, korean chili threads and tofu seasme puree. These were lovely and the guanciale was like fried pork belly, perfect little salty accents standing in for the traditional chinese preparation that uses salty ground pork. Next came one of the two misteps of the evening. The baby back ribs with gochujang sake marinade. Although the ribs were tender, the sauce lacked balance, overly salty and spicy, and overpowered any taste of the meat. I love gochujang and even gochujang ribs, but this preparation was out of balance and makes me wonder if there was some ingredient that they had forgotten to add to thin the sauce. Everyone agreed, could've been a mistake in a busy kitchen. The other miss of the evening was the handmade ramen, the broth was very thin and overly garlicky. Unfortunately the thin noodles had a simultaneously soft and rubbery texture and despite the rubbery texture the noodles were falling apart. Fortunately two outstanding dishes more than made up for the misses. 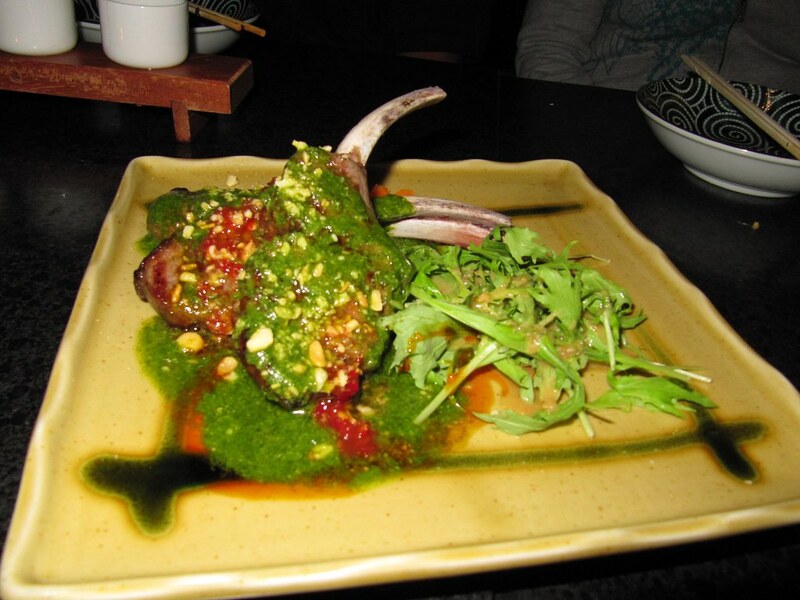 The lamb chops with thai pesto were perfectly tender, juicy lamb chops infused with a spicy pesto. We all loved this dish and I would come back to Namu just to have this again. Korean short rib beef tacos were excellent. 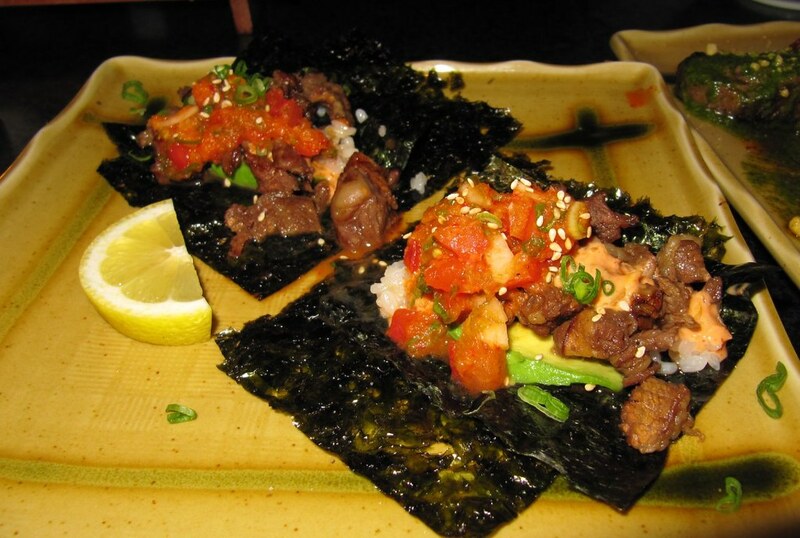 Well marninated short rib wrapped in seaweed and topped with a spicy sauce and kimchi. The seaweed wrapper is definitely an improvement from other Korean tacos. Another winner that made me think about the next time I could get over to the FB for Thursday lunch. The service is excellent the interior is comfortable. I'll return soon to explore more of their menu.